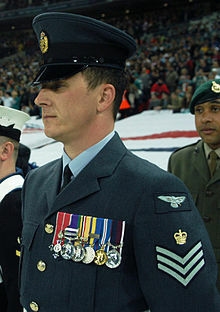 The Royal Air Force uniform is the standardised military dress worn by members of the Royal Air Force. The predominant colours of Royal Air Force uniforms are blue-grey and Wedgwood blue. Many Commonwealth air forces' uniforms are also based on the RAF pattern, but with nationality shoulder flashes. Cadets of the RAFAC which includes the ATC and CCF (RAF) Sections wear similar uniforms. No 1 Service Dress In temperate regions. No 2 Service Working Dress In temperate regions. No 3 Operational Clothing Different patterns for different climates. No 4 Interim Mess Dress For personnel without No 5 dress. No 5 Mess Dress In temperate regions. No 6 Service Dress / Full Dress In warm weather regions. In stone colour, except for 6A (full ceremonial) which is white. No 7 Service Working Dress In warm weather regions. In stone colour. No 8 Mess Dress In warm weather regions. Jacket in white. The RAF's service dress is worn on formal and ceremonial occasions. In temperate regions, it is the most formal uniform in use at present. It remains essentially unchanged from the service dress uniform adopted in the early 1920s. It consists of a blue-grey jacket and trousers (or skirt for female personnel). A great coat may be worn at ceremonial events when the weather is cold. In warm weather regions a stone coloured variant of Service dress is worn. In 1947, the temperate officers' services dress jacket was altered. The lower side pockets were removed and the single slit was replaced by two hacking jacket style slits. The lower button was moved up to a position behind the belt and silk embroidery flying badges were replaced with ones in bullion embroidery. These changes were unpopular and in 1951, with the exception of the lower button move, the former uniform style was re-adopted. No. 1 Service Dress, for temperate regions. Blue-grey colour. No. 1A Service Dress (Ceremonial Day Dress), for temperate regions and for air officers only. As per No. 1 Service Dress. Air vice-marshals and above wear a ceremonial sash and shoulder boards. Entitled air commodores only add the ceremonial sash. No. 6 Service Dress, for warm weather regions. Stone colour. RAF officers wearing No. 1 Service Dress. Air Chief Marshal Sir Clive Loader wearing No. 1A Service Dress (Ceremonial Day Dress). Officer (with sword belt) and men of the RAF Regiment. Air Vice Marshal Harwood wearing No. 6 Service Dress in 2011. 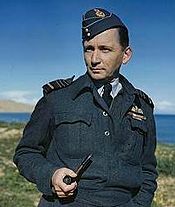 Air Vice-Marshal Philip Wigglesworth in service dress with side hat, 1944. The RAF stable belt may be worn with all forms of service working dress. In warm weather regions a stone coloured variant of Service working dress is worn. Aircrew-specific uniforms are officially designated as Number 14 Dress by the RAF. Aircrew on flying duties wear an olive drab flying suit in temperate regions or a khaki flying suit in desert regions. A leather flying jacket, purchased at individual expense, may be worn with the flying suit but only while the wearer is on the ground. RAF personnel on operations, exercise or in certain tactical formed units wear Multi-Terrain Pattern (MTP) Personal Clothing System Combat Uniform (PCS CU) is a camouflage uniform. This uniform is the same as the British Army's operational uniform. This consists of PCS CU Trousers and Shirt (which is usually worn tucked in, but can be left untucked in warm climates), PCS CU smock and brown boots. A beret or 'Boonie' hat is worn as head dress. In 2006 a 45mm squared tactical recognition flash was introduced for all personnel to wear on the right shoulder of operation clothing. A small rectangular identification patch/badge such as Expeditionary Air Wing (EAW), Expeditionary Air Group (EAG) or Sqn insignia may be worn under the TRF. A Union Flag is worn on the left shoulder. Air Chief Marshal Sir Glenn Torpy wearing No. 5B Mess Dress. In the RAF mess dress, officially designated Number 5 dress, is worn at formal evening functions. All regular officers possess mess dress whereas warrant officers and senior non-commissioned officers wear mess dress if they choose to purchase it. The current mess dress for men consists of a high waisted blue-grey single-breasted jacket fastened at the front by a single link of two RAF buttons connected by a link clip, white marcella shirt, bow tie, waistcoat or cummerbund and blue-grey trousers. Rank, for officers, is indicated in gold braid on the lower sleeve. 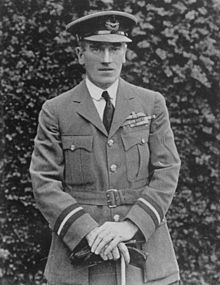 The first RAF mess dress was introduced in 1920 and it featured a high waisted single-breasted blue-grey jacket which tapered to a point at the front below the waist. A blue-grey waistcoat, trousers and black shoes were also worn. Rank was indicated on shoulder boards in gold lace. This uniform was modified in 1928 when the shoes were replaced by boots and overalls with gold lace and bright blue stripes were introduced. This modified form of the uniform lasted until 1934 when it was replaced by a version similar to the current men's mess dress. The wearing of mess dress was suspended during World War II. For women, mess dress currently consists of the same style high waisted blue-grey single-breasted jacket and white marcella shirt as men, a small bow tie and cummerbund and a straight ankle length blue-gray skirt, worn with patent-leather court shoes and barely-black tights or stockings. From the 1970s and prior to the introduction of current women's mess dress in 1996, female officers wore a royal blue "Empire line" dress made of crimplene material with a loose mandarin neck, long sleeves and an ankle length hem. Rank was indicated on a small enamelled brooch worn near the neck. Officers serving on Royal Auxiliary Air Force squadrons in Scotland may wear the Douglas Grey tartan with their mess dress. The RAF tartan was designed in 1988 and it was officially recognised by the Ministry of Defence in 2001. The tartan is worn by the RAF's voluntary pipes bands, although not as part of an official RAF uniform. RAF personnel without No 5 dress, such as airmen, junior officer cadets and some non-regular officers, wear No 1 dress with the blue shirt and tie replaced with a white shirt (not Marcella) and black bow tie should the need to wear mess dress arise. This dress pattern is officially designated Number 4 Dress and was previously known as (Interim) Mess Dress. In April 1920 Air Ministry Weekly Order 332 detailed a full dress uniform. It consisted of a single-breasted jacket in blue-grey with a stand-up collar. Rank was indicated in gold braid on the lower sleeve and white gloves were worn. There is also a full dress uniform for use by officers in the tropics, officially designated as No.6A Full Ceremonial Dress (Warm Weather Areas). It consists of a white tunic with stand collar, matching trousers, blue-grey peaked cap and black leather shoes. It is only issued to specific appointment holders (e.g. aide-de-camp and air attaché), and even then these are hardly ever worn. Other officers may purchase the uniform at their own expense but few choose to do so. With the establishment of the Royal Air Force as an independent service on 1 April 1918, orders were issued detailing new uniform patterns. Major General Mark Kerr designed the first officer uniform which was largely pale blue with gold braid trimmings. Additionally, the Royal Flying Corps' use of khaki was continued. It has been suggested that the pale blue colour was adopted as the cloth had been intended for use by the Imperial Russian Cavalry and, following their disbandment after the Bolshevik Revolution it became available at low cost. As it was the responsibility of officers to buy their own uniforms, a wearing-out period for old uniforms was allowed and the change-over to the air force uniform was slow. The 'wearing out' period also applied to other ranks. Former members of the Royal Flying Corps and the Royal Naval Air Service continued to wear their old uniforms. New recruits into the newly formed Royal Air Force were often issued with the olive green Army Pattern General Service Tunic. Later in 1918 a belted olive green uniform was adopted for other ranks, and it was these tunics that first carried the RAF eagle badges on each shoulder. The pale blue colour for officers' uniforms was unpopular and impractical and John Slessor who was later promoted to Marshal of the RAF described it as "a nasty pale blue with a lot of gold over it, which brought irresistibly to mind a vision of the gentlemen who stands outside the cinema". A little over a year after its introduction, the pale blue colour was discontinued. On 15 September 1919, Air Ministry Order 1049 replaced it with the blue-grey colour which has remained in use to this day. The olive green uniform continued to be worn until 1924 when it too was replaced by a blue-grey colour. War service dress, also known as battle dress, was introduced in 1940 as a blue/grey version of the British Army's battle dress. Initially, war service dress was only worn by air crew. However, in 1943, its use was authorised for all ranks and trades. War service dress continued to be worn after the end of World War II. It was significantly altered in 1948 and not phased out until 1973. Air force rumour later had it that the "air force blue" colour of the postwar uniform had been that of a textile produced in quantity to clothe Russian soldiers during the First World War, and not yet exported when the Russian revolution of 1917 closed that market. A visible distinction between the RAF and the other military services was that all ranks wore a starched collar and tie. Up to 1918, only Officers of the British Army and Royal Navy wore neck-ties; and Officers of all services bought their uniforms from military tailors, while other servicemen were issued clothing from government stocks. Several features of the RAF uniform distinguished officers from airmen; their cap badges were different, airmen's being all brass while officers' were gold-embroidered fabric; airmen wore the RAF eagle patch on both shoulders while officers did not; and the fabric of airmen's wool uniforms was thick and heavy, while officers' uniforms were of "smooth blue" barathea fabric. Another distinction was that while the British Army shod its men only in ankle-high boots the RAF after 1945 also issued its airmen with ordinary shoes for everyday working wear. The shoes maintained the class distinction in that only officers wore shoes with toecaps. Similarly, officers wore unlined brown leather gloves while airmen's gloves were of knitted wool. "Smooth blue" uniforms for non-commissioned personnel were introduced in the 1950s, first for Warrant Officers. By 1956 NCOs of all ranks (corporal and up) were permitted to buy "smooth blue" uniforms at their own expense. Another innovation of the period was raincoats, hitherto worn only by officers. Despite the rainy British climate, the only weather protection for airmen outdoors was either their heavy winter overcoats or the rectangular ground sheets issued for all soldiers' use on campaign. Regulations were altered in the 1950s to allow airmen to wear raincoats bought at their own expense. During 1973 the wartime "Hairy Mary" working dress uniforms were replaced for all ranks with the 1972 pattern No 2 uniforms. Made of a smooth woollen and man-made fibre mix material the jacket was a loose blouson design with a front zip fastener and epaulettes. In the mid 1980s RAF blue crew-necked woollen pullovers were replaced with a new V-neck design featuring blue-grey cloth elbow and shoulder patches plus a pen holder patch on the left sleeve. In the 1990s an RAF blue nylon foul weather jacket and overtrousers were issued. Although not initially intended it quickly became standard practice for officers and other ranks to attach rank badges to the lapels and wear the nylon jacket in place of the uniform raincoat, as a more practical modern wear. The Royal Air Force ranks and insignia form part of the uniform of the Royal Air Force. Royal Air Force rank insignia were based on combination of those of the Royal Navy officer rank insignia and British Army. Badge/Brevet of Royal Air Force Pilot. The Royal New Zealand Air Force uniform is also of the RAF pattern, but with nationality shoulder flashes. The Indian Air Force uniform is also of a similar pattern to the RAF uniform. The Royal Australian Air Force uniform is in midnight blue, instead of grey-blue. Prior to the 1968 unification of the Canadian Forces, the Royal Canadian Air Force service dress was nearly identical to that of the RAF. In 1986 Distinctive Environmental Uniforms (DEU) were introduced to the Canadian Forces and the Air Command (now once again known as the Royal Canadian Air Force) variant maintains some similarity with the RAF's uniform. Until 2014, the RCAF DEU retained the gold sleeve rings (for officers), chevrons (for non-commissioned personnel) and crowns/Royal Arms Of Canada (for warrant officers). On 24 September 2014, the RCAF announced it would return in part to pre-unification RAF-styled insignia; however, with the exception of Private being retitled Aviator (Aviateur in French), rank titles would remain unchanged. Cadets of the ATC and CCF (RAF) Sections wear the uniforms of the Royal Air Force. ^ Routledge, H. (2009). "RAF 1947 Uniform". Uniforms and Insignia of the British Air Force. Retrieved 18 April 2016. ^ Routledge, H. (2009). "RAF Director of Music Uniform". Uniforms and Insignia of the British Air Force. Retrieved 18 April 2016. ^ a b Barrass, M. B. (2015). "Major-General M. E. F. Kerr". Air of Authority – A History of RAF Organisation. Retrieved 18 April 2016. ^ Routledge, H. (2009). "RAF 1918 Light Blue Uniform". Uniforms and Insignia of the British Air Force. Retrieved 18 April 2016. ^ "The Inter-War Years 1919-39". Royal Air Force. 2016. p. 51. Retrieved 18 April 2016. ^ "New insignia for the Royal Canadian Air Force". Royal Canadian Air Force. 24 September 2014. Retrieved 18 April 2016. Hobart, Malcolm (2000). Badges and Uniforms of the Royal Air Force. London, UK: Leo Cooper. ISBN 9780850527391.